June 13: I woke up bright and early. My feet still hurt more than normal from the 29.2-mile tromp the day before, but at least I only needed to do 21 miles today. Practically easy! But I did want to get to Kennedy Meadows as early in the afternoon as possible, which required an early morning start. I ate breakfast, topped up my water, and started hiking. The two girls I woke up the evening before, New Jersey and Gramma Lissa, had still beat me out of camp, but they were hiking slow and I passed them quickly. 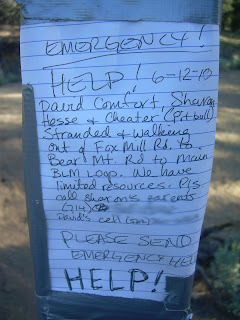 A couple of hours into the hike, I found a note. This one wasn't specifically for me, however. This one was a cry for help. Some folks with limited resources, wanting someone to call one of the person's parents. The note was dated the day before, but there wasn't exactly anything I could do. My cell phone didn't work out here in the middle of anywhere. It was a strange message as well. If there was an emergency, I wouldn't be asking people to call my mom. I'd ask them to call 911! My mom can't do anything to help in a real emergency. I was a little puzzled by the "limited resources" comment. What kind of resources? Not water--the note was posted at a spring. There was plenty of water here! Food? Nobody is going to starve to death overnight due to lack of food. They might be hungry, but it would hardly count as an emergency in my book. And anyhow, let's say my cell phone did work? What was I supposed to tell Sharon's parents? "There's an emergency. I don't know what it is. I don't know where your child is. Have a good day!" So I just took a photo of the note and kept hiking. Later in the afternoon, I caught up with Tradja and Jess. Based on their register entries, I didn't expect to catch up with them, but I was pleased to find them. I still had an apple with me that needed ripping in half. =) We discussed apple-ripping techniques a bit, then I pulled out the fiji apple to try my luck with. It seemed like I couldn't get a good backstop on the apple, slipping out of my fingers, and in a stroke of inspiration, I put the bottom end of the apple against my knee and put the full force of my hands towards ripping the top of the apple in half, and it split. I lost my grip on one half, which went flying into the dirt, but the apple cleaved in two as if I cut in with a knife. A clean, even cut. Though admittedly, it seemed a little like cheating to use my knee to get the job done. We continued hiking, and I stopped at Manter Creek for lunch. Dorian and Josh, the French-speaking folks, had already stopped there for lunch, so I sat down by them and started to cook a dinner. It was lunch time, but I was especially hungry which I blamed on the lack of dinner from the night before, and decided to eat the dinner I still carried: Hamburger Helper. Tradja and Jess caught up shortly after I stopped, and joined the growing lunch crowd. I added a bit too much water to the Hamburger Helper, and Tradja looked at it commenting that it looked more like soup. I hoped it would thicken a bit, but it did look a lot like soup. Jess said, "Just give it a fancy French name, and it'll sound great!" We laughed at that, then Dorian and Josh started making suggestions. I wish I could repeat them here, but I know absolutely no French except "Voila!" and can't remember any of the suggestions, but they did sound exotic and fancy. Tradja suggested "sopa de mierda," and I wagged my finger at him. "I know enough Spanish to know what that means," I told him, "and that doesn't sound good!" Though I suppose to someone who doesn't know Spanish, they might think it sounds exotic and wonderful. "Yes, please, I'll take the sopa de mierda. Does that come with garlic bread?" The hamburger helper thickened nicely by the time the fuel ran out, and while I was eating, the rest of the hikers continued on. I ate, cleaned up, then continued on myself. The last part of the hike was largely flat, but my feet were hurting and I started limping a bit. I reached the road, my end point, at around 4:00 in the afternoon. Quite remarkable to finish 21 miles by 4:00 in the afternoon. I was sad not to see Amanda parked by the trailhead, however. My ride had not yet arrived. I walked up the road 0.7 miles towards the general store. At least I could get a cold drink and pick up my maildrop while waiting for Amanda to show, and perhaps find some other hikers lurking around. Amanda was parked at the general store when I arrived. "Why didn't you pick me up the trailhead?" I asked, wishing I hadn't had to walk 15 minutes off the trail. "This isn't the trail?" she asked. "I thought this was the trail. Hikers are everywhere!" *sigh* It's true, hikers were everywhere. There were probably a dozen of them hanging around outside of the general store. Certainly a hiker hot spot, but no, not the trail. Amanda gave me a coldish drink, and had already picked up my maildrop for me, but I still went into the general store to sign the register. Then I jumped in the car, and Amanda drove me out to a real town with hotels, Internet access, and restaurants. We checked into the Vagabond in Ridgecrest, then went out for dinner to Pizza Hut. Good stuff! Okay, AWESOME You cleaved the apple in half! BUT what about the emergency call to Sharon's parents??!? This is so ...stay tuned...and then we'll discover that the rest of the story is pay-per-view. Yes I am also curious about the "emergency" note people... I hope they are okay did you ask any of the other hikers about this note? I'll tune in. Same hiker channel, same hiker time.!!! Re: apple-ripping techniques. I bought a huge bag of apples (big red delicious) at Costco and every day I attempt to rip one apart...It's not working. My question is "does size matter?" And does it help if the apple is not fresh from the fridge? An apple a day is supposed to keep the doctor away, but at this rate, I may wind up straining something. I hope those hikers were ok. They did actually say where they were and where they were heading. But they were able to walk, so they obviously weren't stranded. I agree that the message seemed sort of cryptic. And if it was a serious emergency, they'd have wanted someone to call 911. As for the sopa de mierda.....if you used the local water out of the spring or creek, which we all know is tinted by snake poop, the name makes perfect sense. hahah!